Tired of going it solo in a duel? Is one lone fighter just not enough? Strikers are the answer! Strikers allow you to call in your favorite characters during a duel and utilize their attack or support abilities. They shine the most in Tag-Team games, where you can constantly swap in and out your characters to take advantage of a whole gamut of new coordinated combos. BattleCON: Strikers adds a new dimension to the classic BattleCON formula by giving you the ability to call in team-mates for support or a pinch attack! Strikers enhances Tag Team Mode or Standard Duels for any BattleCON base game! NOTE: This expansion was originally released as a stretch goal to pledgers of the BattleCON: Devastation of Indines Kickstarter. It has been repackaged and made available for purchase through retail outlets. This is a mini-expansion, not a standalone game. It requires BattleCON: War of Indines, BattleCON: Devastation of Indines, or BattleCON: Fate of Indines to play. 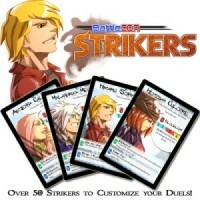 Add a Review for "BattleCON: Strikers"